Are you young startups or entrepreneurs who are interested in doing digital business in Cambodia? Cambodia is still a beginning in term of online content - which is the global trend now - it means that there are many opportunities for young startups and entrepreneurs. 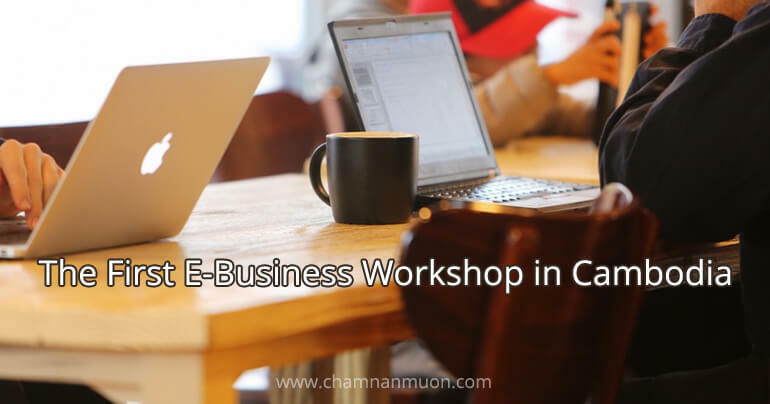 Come and listen to the first-ever event “E-Business Workshop”, an English-speaking conference in Cambodia, which will be held on March 26, 2016, at 2.00pm at Emerald Hub, to meet a few key online Cambodian players who will share their experiences. Interested in the workshop? Get your free ticket here. Are you interested in something that is innovative or technology related, and you want to make a change in society using technology? If you say 'yes', here is a chance where you can learn from Inno-Tech Festival Cambodia 2016. 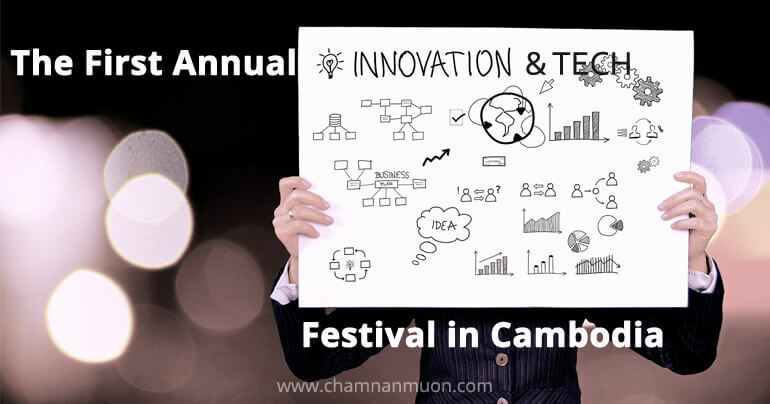 Inno-Tech Festival Cambodia 2016 is the 1st annual event to celebrate and showcase social innovations and technology made in Cambodia. This festival is open for all and will be held over two days from March 18 to 19, 2016 at the Institute of Technology of Cambodia. There will be 50 exhibition booths from organizations showcase recent and ongoing innovative solutions from Cambodian NGOs, businesses, and government agencies representing the best of innovations for Cambodia. What the Event Benefits You? #1 Watch people building innovation: Young professionals, students, and experts participate in INNO TECH-a-THON, collaborating in teams to develop practical solutions for real problems in Cambodia. #2 Learn about issues, challenges and cutting edge innovations: Open workshop & roundtable discussions on a wide range of topics including lessons learned, reports from innovations tried in the field, using open data, internet security, the technology uses on specific topics, etc. #3 Meet new people: Connection Cafe is a space for meeting people from different backgrounds and interests, but with the same passion for change and innovations. You Need to Know the Programs (in Brief)? 10:00 AM – 5:00 PM: Teams start discussing ideas and work on the solutions to create prototypes. 1:30 PM: Updates from the teams. Find the Full Programs and Venue & Floor Plan! For more information about this event, please check out the Facebook page and website of InnoTech Festival Cambodia. 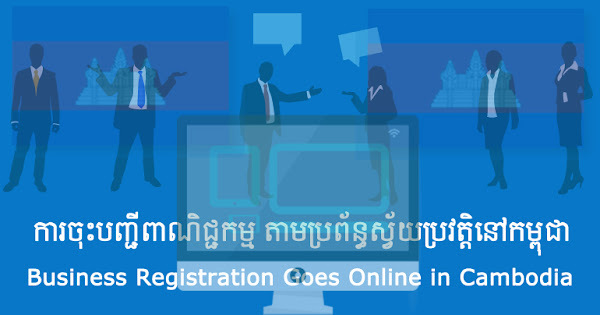 Starting on January 4, 2016, every businessman and trade companies that have established their headquarters, branches, representative offices, affiliates or agents based in the Kingdom of Cambodia are obligated to register their businesses through the Ministry of Commerce’s automated business registration system from anywhere via this website: businessregistration.moc.gov.kh. The Commerce Ministry also announced to all 42,000 companies that currently registered to do business in Cambodia would be required to re-register online before March 31 or pay a fine. What is the ease of doing business rank in Cambodia? The World Bank currently ranks Cambodia 180 out of 189 countries on the ease of starting a business, and estimated in its most recent Doing Business 2016 report that it takes an average of three to four weeks to register a company with the government. The new system as a way to make Cambodia more attractive to investors, eliminating face-to-face interactions between government officials and businesspeople and reducing the role of the brokers who previously guided applicants through the complex registration process. I am confident that Cambodia would be able to significantly improve on that score with its revamped registration process, which now takes only about an hour. It can allow a company to be created at any place with Internet, and the registrants can print the documents themselves, Commerce Minister Sun Chanthol said on The Cambodia Daily. Fee via this online registraion? It costs 1,720,000 riel (about $430) which companies can pay via ACLEDA bank's online payment or the online payment couldn’t function properly, customers are still able to pay the public service fee at ACELEDA BANK, CANADIA BANK, and FOREIGN TRADE BANK. Find more about the Business Registration Fee here. Are you still unclear about this new system? For more information, please contact Business Registration Department of Ministry of Commerce located at Lot 19-61, MOC Road (113B Road), turn in from Russian Blvd, Phum Teuk Thla, Sangkat Teuk Thla, Khan Sen Sok, Phnom Penh, Kingdom of Cambodia (see on Google Maps) or call to 023 866 050. Have something to say? COMMENT NOW! Phnom Penh: A new campaign called GoGoCambodia was announced to start implementing on the afternoon of 02 January 2016 at AEON Mall with the presence of a group of youth, successful entrepreneurs, national championships, popular football players and celebrities, and hundreds of others. GoGoCambodia is a national campaign, initiated by a group of youth members of You & I, aiming to mobilize Cambodian pride in various sectors from education to national defense, and translate the will to a platform whereby every single Cambodian can show his/her individual pride as a Cambodian and a Cambodia’s pride at large to the international community. 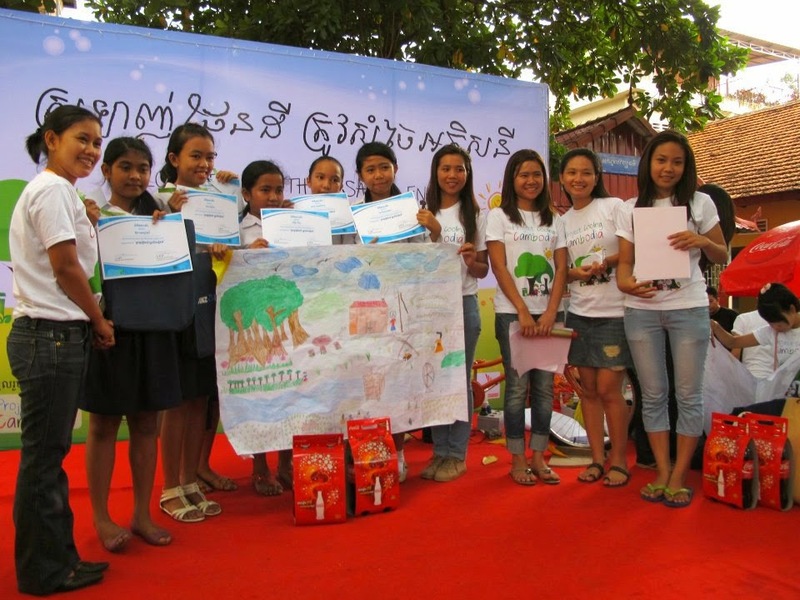 GoGoCambodia adopts the perspective that if anyone could accomplish a task which is useful for developing and promoting national pride, others may also do well. 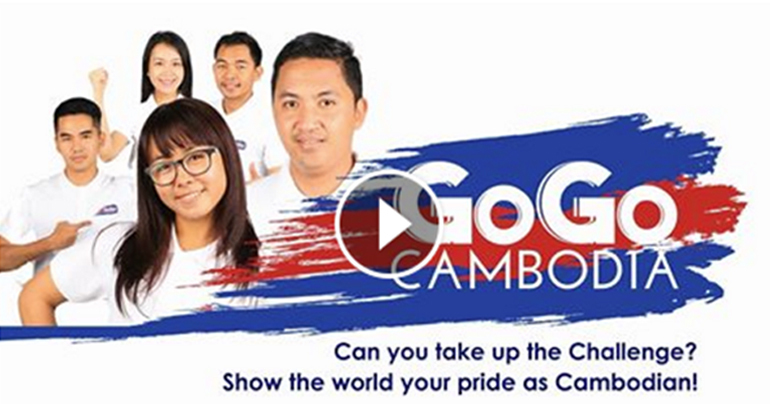 The campaign urges all Cambodian next generations believe that the country is the best choice for their future. Keep in touch with the campaign on its official Facebook page. 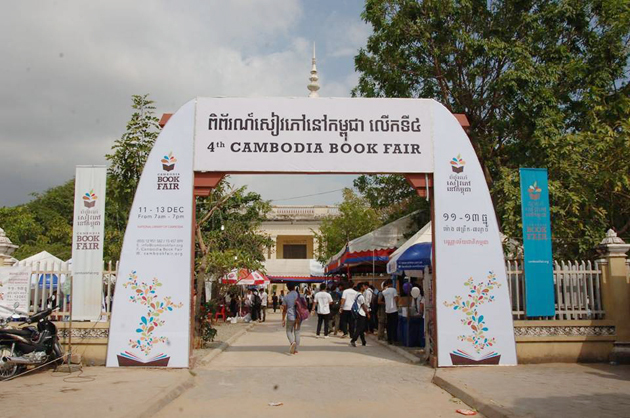 Main entrance of 4th Cambodia Book Fair (Hun Yuthkun / AKP). In an effort to participate in promoting book publishing and reading in Cambodia, the Ministry of Culture and Fine Arts through the National Library of Cambodia are partnering with the Ministry of Education, Youth and Sport, and the Cambodian Librarians and Documentalists Association, and the support from many other stakeholders including Sipar, Room to Read, SVA, IBBY, French Institute of Cambodia, HSL RUPP and PUC Library has annually organized the Cambodia Book Fair. The 4th Cambodia Book Fair will take place on 11-13 December 2015 at the National Library of Cambodia with the theme of this year is “Read me today, succeed tomorrow”. To raise awareness about availability of books in Khmer or other foreign languages, particularly books about Cambodia and children books. Will you join next year? Keep in touch with them on the official Facebook page! Have you felt hot for few days during daytime and nighttime in our country, Cambodia? Personally I do not notice it seriously because I have known about Global Warming not only Cambodia but in the world increasing presently; but last week when I drove out for doing my personal issue on break time, I noticed that it was so hot for me during the day and night times. This is the reason reminds me on one-year-ago social event "Project Cooling Cambodia - Love the Earth by Saving Energy" I had joined which invited and organized by Mrs. Lay Sotheany with her friend named Ms. James who both of them had attended the Leadership Training Program in Japan of IATSS FORUM and brought back along with this fruitful project. At the event that was celebrated in Chaktomuk Primary School last year, I really enjoyed with her team, some volunteers from ANZ Royal bank, working together to explain the younger students on how to save energy and got them draw a nice green-environment house in group then competed each other to find the best photo; the winner group grained nice gifts (books, pens...). What I learned from this social event? I was so pleased to see the younger generations knowing this issue and brought back this information to tell their parents. These are not only their issue or me or you but our all because you and I also are a member of a family, community, society, country and a globe. For me, I have some idea similarly to the above tips but all I practice it everyday, and I think all what I would share here, you my beloved readers do it as well. 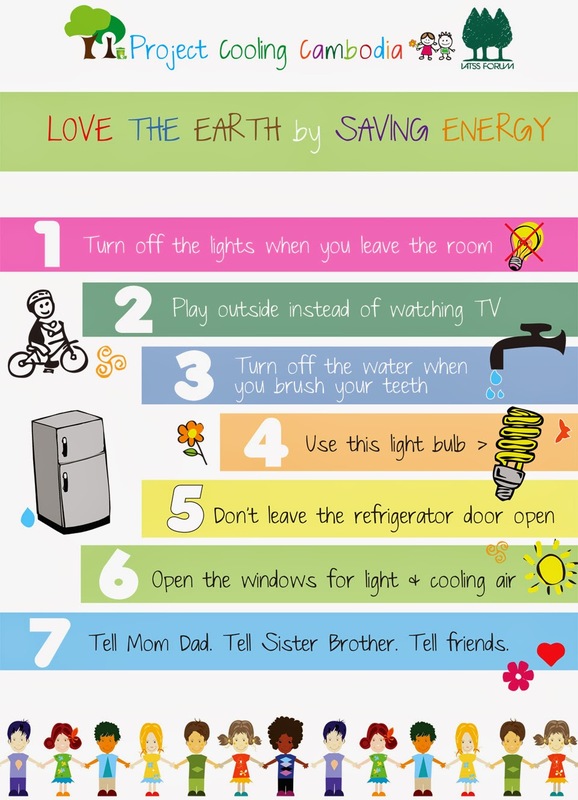 It Saves You Money, Safe Your Security, Save Your Family's Expense, Save the Earth!! The Global Warming issue is considering by over the world but it starts from you!!! If you have any more personal idea, kindly share it for me too, and kindly share this if you love the GREEN like me as well. The Ministry of Education, Youth and Sport (MoEYS) offers the Scholarships Program (Human Resource Development Scholarship: JDS) under the Grant Aid of Official Development Assistance (ODA) of the Government of Japan. 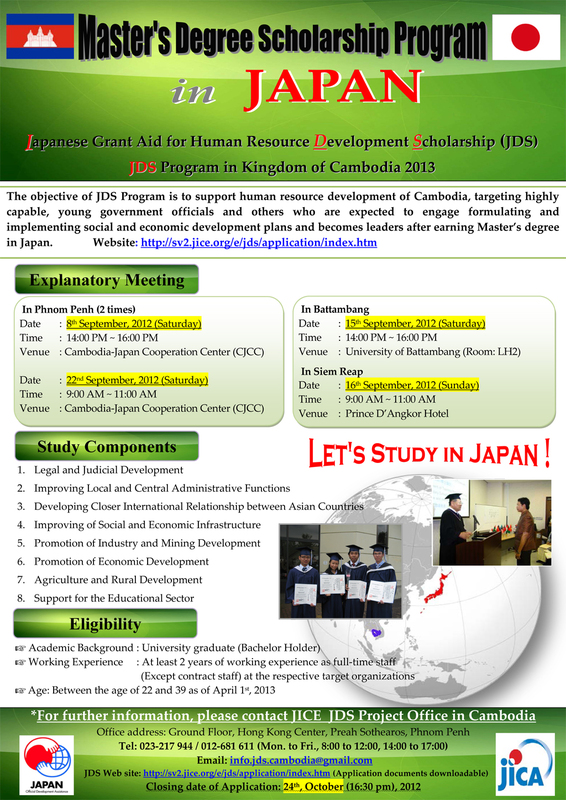 The objective of JDS Program is to support human resource development of Cambodia, targeting highly capable, young government officials and others who are expected to engage in formulating and implementing social and economic development plans and become leaders after earning Master’s degree (English course) in Japan. Introduction Seminars on this Scholarship program will be held and to instruct how to fill the application forms and to provide other detailed information on the following dates and venues. As Cambodia becomes more stable, many foreign investors are interested in investing to this country. For instance, Japanese investors are increasing rapidly (according to Japanese Business Association in Cambodia). 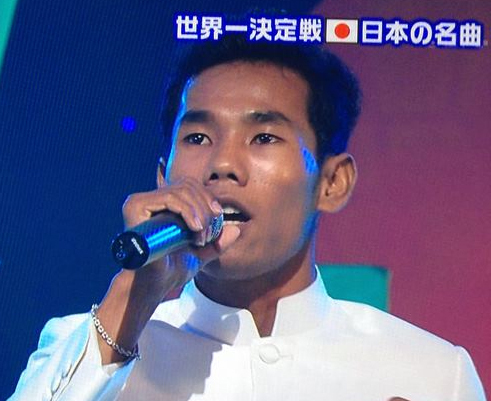 Therefore the chances of employment in Japanese companies in Cambodia are also high. Taking this opportunity, Japanese Business Association in Cambodia (JBAC), Japanese Department at Royal University of Phnom Penh and Cambodia-Japan Cooperation Center (CJCC) had co-organized an event “Japanese Companies Job Fair”. The event was held on Wednesday, 18 July in the morning from 9:00-12:00 at Angkor-Kizuna Hall, Cambodia-Japan Cooperation Center in RUPP campus, Russian Confederation Blvd, Tuol Kork, Phnom Penh, Cambodia. There are 33 Japanese companies’ booths were placed on the day of the event. At the same time, there were interviews between Japanese companies and Cambodian participants who wish to apply to companies they were interested in as well. Moreover, there were 11 presentations from Japanese companies in CJCC seminar rooms to introduce their companies and recruitment process to all participants. During the special event for Cambodian job seekers, there were more than 600 participants came to visit both Cambodian and foreigners. The application period for the 2013 ASEAN Scholarships for Cambodia is extended to 9 July 2012 (10.00 pm) Cambodia Time. Please submit your application via our online application system. Please refer to FAQs if you encounter difficulties during application. The ASEAN Scholarships for Cambodia is tenable for 4 years leading to the award of the Singapore-Cambridge General Certificate of Education Advanced Level (GCE A-Level) (or equivalent) certificate. Students from Cambodia are welcome to apply for the ASEAN Scholarships for Cambodia to enter Singapore schools at the Secondary Three level. Candidates who are not short-listed for the scholarships will be considered for the Merit Awards. Candidates short-listed for the selection test/interview will be notified at least 1 week before the selection test/interview dates. We regret that only short-listed candidates will be notified. There are 2 modes of application – online or hardcopy application. Each applicant should submit only ONE application. Please do not submit a hard copy application if you have chosen to apply online and vice versa. Applicants are strongly encouraged to apply online. For online scholarship applications, please use the online application system. If you encounter difficulties in the online application system, you may contact our customer service centre at +65 6872 2220 . Applicants who do not have internet access may obtain the hardcopy forms from the Cambodia Ministry of Education, Youth and Sport. Please note that all hardcopy application forms must be verified and endorsed by the Cambodia Ministry of Education, Youth & Sports. Alternatively, applicants may also print out a copy of the application form (669kb .pdf). Original documents that are not in English must be translated; the translations must be accompanied by a photocopy of the original documents. Please do not send any original documents. 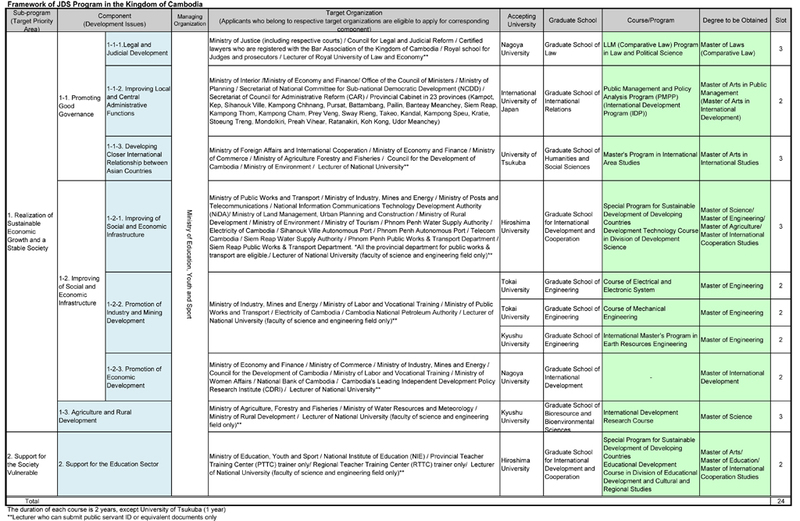 All applications and supporting documents should reach the Singapore Ministry of Education before the closing date, 9 July 2012. The selection tests and interviews will be conducted in Phnom Penh.